Internet freedom is being threatened and can possibly be limited soon if Net Neutrality is dismantled. On Dec. 14 Ajit Pai, the Trump-appointed chairman of the Federal Communications Commission is threatening to rollback protections on Net Neutrality. 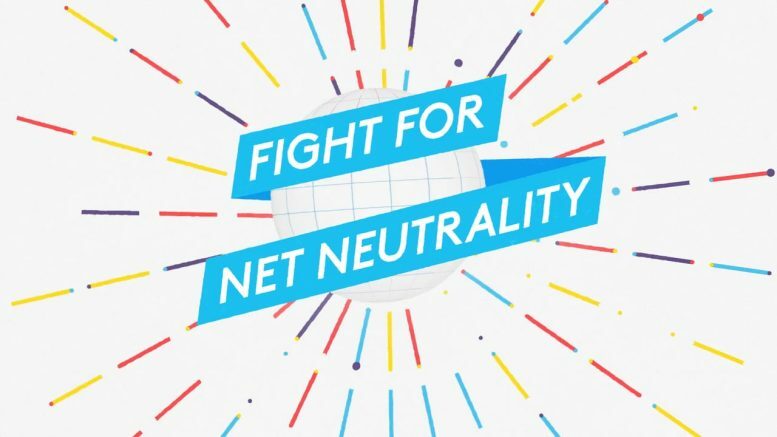 Net Neutrality gives equal access to internet consumers and prevents Internet service providers or Internet Service Providers from charging extra fees or paying higher prices for faster streams. It also prevents the ISPs from stopping or slowing down service. The plan was released on Nov. 21. The FCC has received over 20 million comments from citizens expressing various complaints from all political spectrums but have not acknowledged them and plan to move forward. Individual states have. Many states have indicated that they will implement their own individual Net Neutrality access if the new plan is pushed through, however the FCC responded with threats saying: “If a state attempts to impose its own net neutrality law and a company objects to FCC, the agency could issue a ruling that could be used in a court battle,” according to Margaret Harding McGill of Politico. “Internet service providers want to avoid a repeat of what happened this year on broadband privacy, when nearly two dozen states proposed legislation to replace an Obama-FCC regulation that congress revoked. Pai’s Restoring Internet Freedom’ order says that the states and local regulations attempting to regulate broadband in ways that run counter to the federal rules would be pre-emted,” said Margaret Harding McGill, Politico. Pai is declaring that his plan will bring internet freedom, but this word is misused when concerning the general public. Pai further explains that the plan would give freedom from regulations that Obama put in place, but the regulations that were put in place from Obama were to protect the consumers from corporations doing what they want with the internet. The Obama administration set up government rules that would prevent any corporation control over the internet. The rules said the internet must be free and equal to everyone in it. This plan will allow I.S.P.s to cater to their business partners. It will give faster speeds to partners they favor while slowing down or completely blocking access to others. Broadband providers will have control by charging internet companies what they want for their access, in turn those companies that consumers access daily could begin charging their customers because they are being charged. Sites like Netflix could start costing more than $9.99 a month if Net Neutrality is dismantled. “Think about it this way, there’s one pipe going into your house, a public utility, like electricity or water. If the government doesn’t regulate it, they might go, oh you were paying $80 for your water? its now $1000 a month, but wait a minute, that will squeeze everything else out, I will have to be basically working for the water company, That’s right, its the only pipe going into your house, do you want water or do you not want water?” Cenk Uygur, The Young Turks. In a social and political spectrum, dismantling Net Neutrality can be detrimental to the societal health of the country. “If you have multi national corporations in charge of your internet, that could be a very dangerous place to live in, especially when you consider the fact that as a country we are so incredibly divided, I see this as making things a lot worse, You need the internet just like you need colleges to be a free market place of ideas and right now I’m really concerned that these giant internet service providers, many of which are media conglomerates as well, they own a bunch of media, will now decide that you only get to see certain things, you only get to be informed by our perspective, and anything that disagrees with our perspective will be slowed down to the point where its inaccessible,” said Ana Kasperian of the Young Turks. Be the first to comment on "Freedom of the Internet threatened in new net neutrality rollback plan"